On The Night Of A Full Moon is a stunning tribute to the versatility and expertise of the Maki-e Shi, and the possibilities that can be explored in Japanese Lacquer Art. 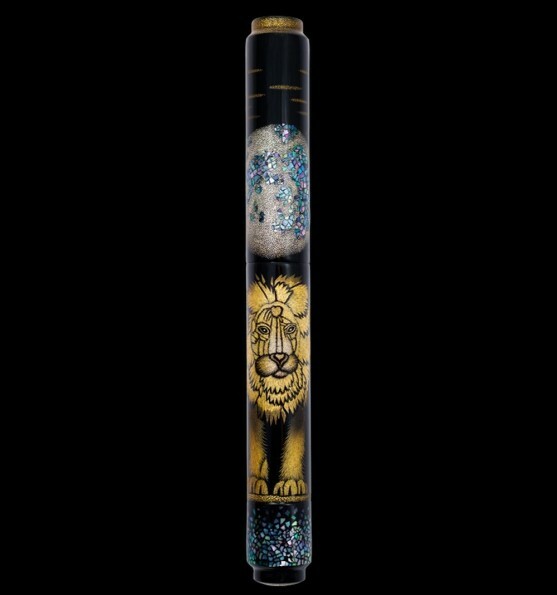 This fabulous writing instrument tells the story of a proud Lion, on a night prowl under a luminous full moon. Set against a radiant Black Urushi backdrop created through the very traditional Honji technique, as used in ancient Inro, the Artist has then applied a closely guarded family technique of Chinkin Kebori, very suited to expressing fine animal hair. The full moon is adorned with fine, beautiful pieces of shimmering Raden, applied through the Nurikomi method.